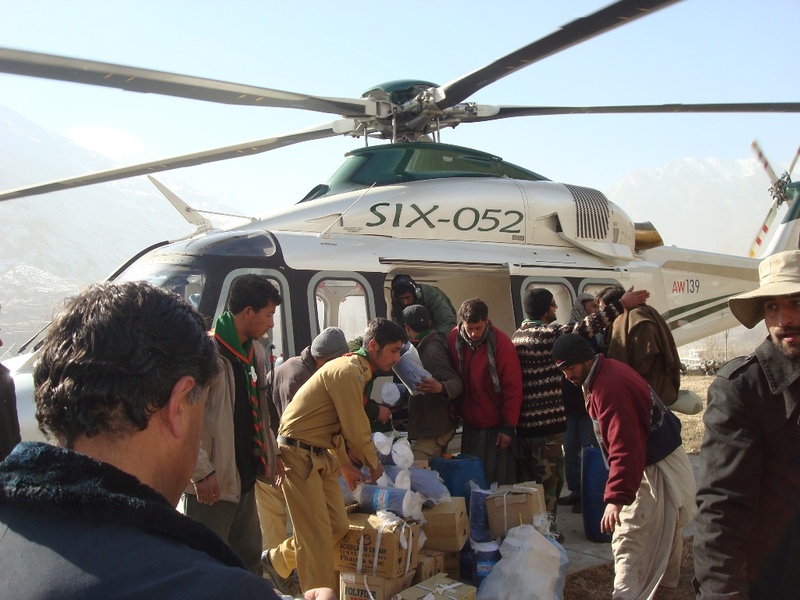 2016 avalanche floods and landslide: AKAH Volunteers helping critical patients in parts of Gilgit-Baltistan, using AKDN helicopter. Healthcare after the devasting floods that hit Pakistan in 2010. Over 700 trained volunteers from AKAH Pakistan’s Search and Rescue, Disaster Assessment Response and Community Emergency Response Teams have been mobilised to respond to the devastating flooding in Chitral and Gilgit-Baltistan in August 2015. Volunteers offloading medicines and relief goods received for Gojal. The AKDN response to the devasting floods that hit Pakistan in 2010 and 2011 illustrates the Network's unique capacity to mobilise and coordinate services at local, national and international levels. The Aga Khan Agency for Habitat (AKAH) – formerly Focus Humanitarian Assistance - has been working in Pakistan since 1998, with a vision to save lives, reduce suffering and create resilience in communities prone to man-made and natural disasters. Its humanitarian activities include the training of Emergency Management teams. These teams aim to build resilience against disaster events and build the capacity of community members in Disaster Risk Reduction (DRR) and Community-Based Disaster Risk Management (CBDRM). The project also conducts hazard and risk assessments and works to improve risk anticipation through the establishment of an Early Warning System (EWS). AKAH has trained tens of thousands of volunteers for disaster response and management across Central and South Asia, and many more in the other countries in which it works. For its work in Pakistan, it is the recipient of the Sitara-i-Eisaar award, which was conferred by the Government of Pakistan in recognition of its humanitarian assistance during the 2005 Kashmir Earthquake. 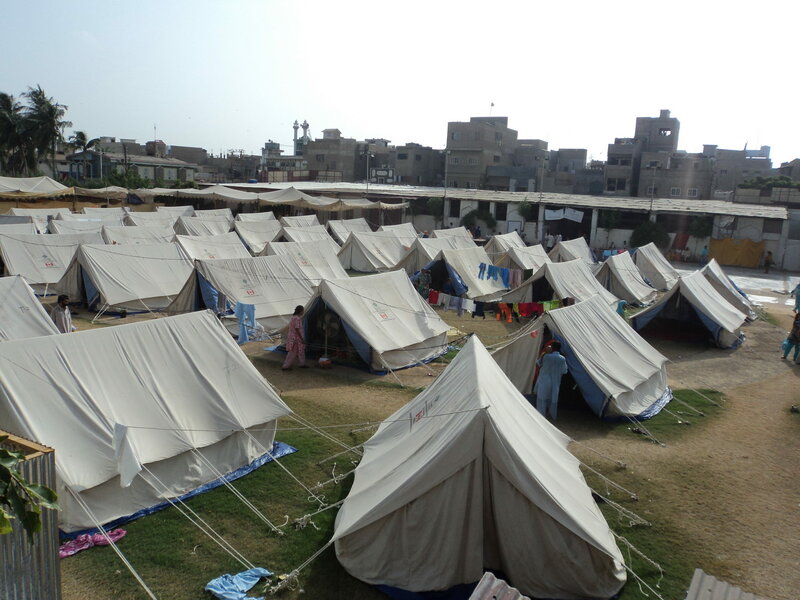 Following the devastating floods that hit Pakistan in the late summer of 2010, AKPBS has provided temporary shelters for thousands of people who lost their homes. During its initial years, AKAH Pakistan hosted a large influx of Afghan refugees through camp management, providing food, shelter, education and skill development programmes. With support from the Office of the United Nations High Commissioner for Refugees, AKAH facilitated the return of approximately 43,000 Afghans to their home country. In 1999, AKAH Pakistan helped to pioneer the concept of Community-Based Disaster Risk Management. This involves building the capacity of communities to better prepare for and respond to natural and man-made hazards. In 2006, in recognition of its humanitarian and Disaster Risk Reduction (DRR) work in Pakistan, AKAH was awarded the Sitara-i-Eisaar by the President of the Islamic Republic of Pakistan. In high altitude areas of Pakistan, AKAH holds simulation exercises with specialist partner organisations to ensure its search and rescue team have updated skills and are ready for deployment at any time. AKAH implements a range of risk reduction programmes to build resilience among mountainous and coastal communities that are prone to disasters and enhance their response capacity. Informed and organised communities are better prepared to confront hazards and show a greater resiliency and capacity for immediate response when coping with disasters. Community-Based Disaster Risk Management aims to build upon local knowledge with technical skills that enable and empower communities to cope with, prepare for, prevent, mitigate, respond to and quickly recover from natural and man-made disasters in urban and rural areas. It involves the participation of community members to identify and understand local hazards, as well as build their basic disaster management skills in first aid, search and rescue, fire safety, safe haven location and Village Based Disaster Risk Management Planning. Community volunteers trained by AKAH are aware of their local hazards and are able to be first responders in disaster situations. The role of these Community Emergency Response Teams (CERTs) is critical, particularly in communities located in risk-prone mountainous and isolated locations. Over the years, AKAH has established 162 structured CERTs across Pakistan and has trained over 36,000 community volunteers (over 50% women) as first responders. Emergency stockpiles with items such as tents, blankets, search tools and first aid are also provided at the community level to strengthen local response capacities. AKAH has also supported the Government of Pakistan in preparing the country’s National Disaster Management Plan and Community Based Disaster Risk Management guidelines (2012). AKAH Pakistan’s School Safety Programme (SSP) aims to actively engage students and school management in raising awareness, developing emergency and evacuation plans, assess school hazards, and develop response capacity at the school level, by training students, teachers and parents. The Aga Khan Development Network (AKDN) through AKAH Pakistan initiated Pakistan’s first school safety programme in 2006. In an effort to further enhance and strengthen school safety in Pakistan, AKAH organised an International Conference on School Safety in May 2008. AKAH in collaboration with the Government of Pakistan and various donor and UN agencies, in addition to international non-governmental organisations (INGOs), provided technical and financial input to develop a School Safety Strategy for the Government of Gilgit-Baltistan. The conference also marked the declaration of May 16 as the annual National School Safety Day. AKAH continues to run school safety initiatives across the country in partnership with respective governments, UN agencies and INGOs. a project to improve DRR practices in over 100 schools in Gilgit-Baltistan with support from the Australian Agency for International Development. Moreover, with technical assistance from the National Society for Earthquake Technology Nepal and Aga Khan Education Service Pakistan, local villagers were trained in stone masonry to retrofit a school in Nomal village, Gilgit. Hazard Vulnerability and Risk Assessments (HVRAs) are systematic approaches to identifying hazards or risks that have an impact on disaster-prone communities. This involves teams of geologists and geographic information system specialists to conduct hazard and risk assessments at the village level. The process also involves local communities to identify and analyse risks through historical data collection and participatory hazard mapping. The data gathered through geologists and communities are further analysed and hazard and risk maps are prepared. These maps are effective tools for disaster risk reduction and are also instrumental for ensuring that risk and hazards are avoided while implementing development interventions at the village level. AKAH Pakistan has produced hazard and risk maps for 658 villages with over 600,000 habitants in Gilgit-Baltistan and Chitral (GBC) and also 112 maps for urban settlements. AKAH Pakistan’s disaster response programme is divided into two components: i) search and rescue operations immediately after disasters, and ii) humanitarian relief including provision of food and non-food aid, shelter and camp management for those affected by disaster internally or for refugees. AKAH is one of the leading and most experienced disaster response agencies in Pakistan. 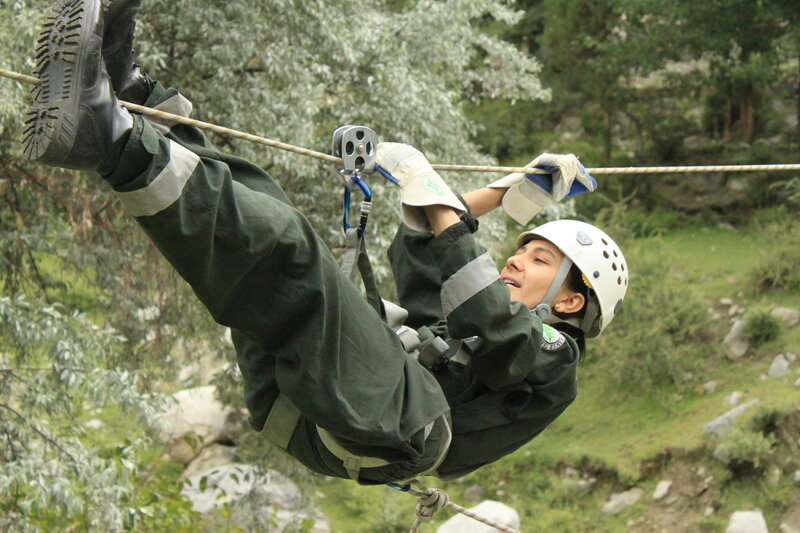 Search and Rescue: AKAH Pakistan has a 40-member specialised search and rescue team (SART). Members are located in Gilgit, Chitral and Karachi and have been trained by the United Kingdom International Search and Rescue Team, IntOps AB Sweden and Pompiers de l'Urgence Internationale, a group of French fire fighters in urban and mountain search and rescue. The team has been provided equipment to conduct search and rescue across the country. SART members are trained on a monthly basis and are all dedicated volunteers, 35% of whom are women. Humanitarian Relief: Following a disaster, AKAH Pakistan immediately deploys its volunteer Disaster Assessment and Response Teams (DARTs). The teams are trained based on the standards of UNOCHA (United Nations Office for the Coordination of Humanitarian Affairs) to determine the immediate basic humanitarian needs after a disaster. Based on the DART reports, food, non-food aid and shelter is provided to those affected by the disaster, with support from and in collaboration with government authorities, donors, UN agencies and INGOs. Afghan Refugee Programme: The Afghan Refugee programme was initiated in 1998 and benefitted over 43,000 Afghan nationals over eight years. The refugees were hosted in various camps and later repatriated to Afghanistan in collaboration with the United Nations High Commissioner for Refugees. Astor Earthquake, 2002: Astor was hit by an earthquake which resulted in the loss of many lives and destruction of property. In response, AKAH provided food and non-food aid to over 100 households (1,000 individuals) that were directly affected. Kashmir Earthquake, 2005: Following the devastating 7.6 magnitude earthquake that shook Kashmir, AKAH immediately engaged its Search and Recue Teams from Gilgit and Chitral. Coordinating its relief efforts with the Pakistan Army and with the support of the AKDN helicopters, AKAH reached approximately 150,000 affected individuals who benefitted from food, safe drinking water, clothing, shelter, blankets, vital medicine as well as toys for the young. In addition, the Aga Khan University established a mobile hospital in Kashmir. The emergency response project phased out with the inception of an AKDN rehabilitation and recovery project in Chakama, Kashmir. Snow Avalanche Response District Ghizer, 2005: Ghizer District in Gilgit-Baltistan was impacted by heavy snowfall and a series of avalanches leaving much of the population stranded. AKAH in collaboration with World Food Programme (WFP) provided food to over 1,500 households, approximately 15,000 people. Snowfall and Avalanche Response Chitral, 2007: Chitral was hit by consecutive snow avalanches, to which AKAH responded immediately and provided food and non-food relief for over 6,000 people in 28 villages. Baluchistan Earthquake Response, 2008: Baluchistan was shaken by a massive earthquake in October. AKAH provided food and non-food items to over 2,000 households comprising of 14,000 individuals across three districts of Baluchistan. Attabad Landslide Response, 2010: AKAH emergency response teams were immediately mobilised to respond to the devastating landslide that struck the Attabad region of the Hunza Valley in Northern Pakistan. AKAH, in collaboration with the Aga Khan Council for Pakistan, agencies of the AKDN, local government and the Pakistan army, provided food and non-food aid to 28,000 people, assisted with evacuation efforts and managed camps for the internally displaced. Monsoon Flood Response, 2010: AKAH, working with AKDN agencies and other civil society organisations, launched a relief effort to assist the thousands of people displaced by the devastating floods in Gilgit-Baltistan, Khyber Pakhtunkhwa and Sindh provinces in Pakistan. With assistance from thousands of trained volunteers and support from the community, AKAH and the AKDN supported the safe evacuation of vulnerable communities, construction of bridges and roads, as well as camp management. Food and non-food aid was provided to approximately 30,000 households (270,000 people) with support from the WFP in Gilgit-Baltistan and Chitral. In addition, non-food aid was distributed to around 8,000 households in Sindh through the Office of United States Foreign Disaster Assistance. Earthquake Response in Chitral and Gilgit-Baltistan, 2015: A massive earthquake struck Badakhshan Province in Afghanistan on 26 October 2015, which affected Pakistan including Khyber Pakhtunkhwa, Gilgit-Baltistan, Federally Administrated Tribal Areas, Punjab, Kashmir, and Baluchistan. This incident impacted 168 villages and damaged over 8,000 houses. AKAH responded to this disaster by mobilising its trained Community Emergency Response Teams to evacuate people and provide immediate humanitarian relief. Emergency Operation Centres were established for coordination between AKDN agencies and government departments. Approximately 2,300 households (20,700 people) were provided food and non-food relief. In addition, 3,300 families were provided food aid with support from the WFP. 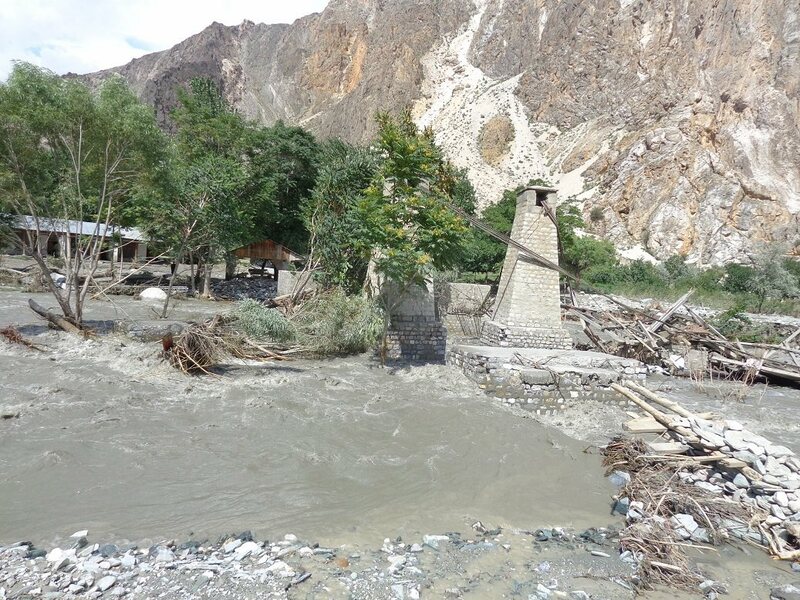 Flash Flood Response in Chitral and Gilgit-Baltistan, 2015: Gilgit–Baltistan and Chitral were hit by devastating flash floods in July 2015. The floods impacted access to roads, destroyed infrastructure and completely damaged over 1,800 homes leaving approximately 15,000 people homeless. 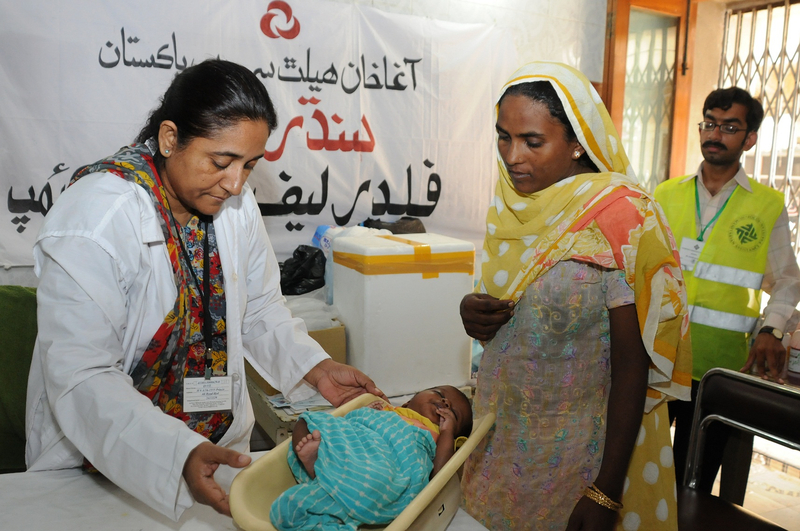 AKAH Pakistan deployed over 1,500 emergency response volunteers including CERTS, SARTs and DARTs. Rapid assessments of the disaster-affected area were conducted and shared with all stakeholders. About 3,300 households (29,700 individuals) were provided with food for three months. Over 1,000 households were provided with shelter kits. 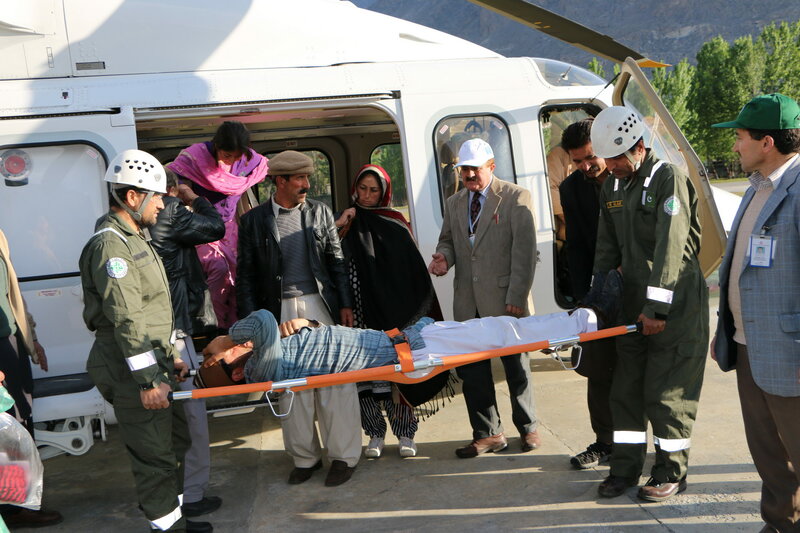 Two AKDN helicopters were deployed for emergency relief operations and the evacuation of people requiring medical attention and assisting the stranded. Avalanche, Floods and Landslides, 2016: Heavy rain and snowfall that continued for 48 hours brought life to a standstill in parts of Gilgit-Baltistan and Chitral. It triggered a series of snow avalanches, unusual flash floods and landslides damaging 600 houses with thousands of other homes reporting leaks in the roof. AKAH Pakistan immediately responded to the crisis and deployed its DART to conduct rapid assessments working with local communities. Over 100 affected households were provided tents and blankets from community stockpiles set up by AKAH Pakistan for emergencies. Water purification sachets were provided to over 50 households in Oshikhandas and Sherqilla.